The role of a server at St Mary’s is vital to the smooth operation of our regular Sunday services. 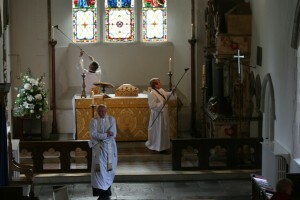 They prepare the Altar for worship and ensure that the colours that follow the church calendar are observed. They look after the church’s plate and silver that are regularly used at the Eucharist. Indeed the set of plate that are used at St Mary’s every Sunday have been used for at least 200 years. Servers are admitted to the Order of St Mark. If you are interested in serving at St Mary’s, do let the Vicar know or speak to one of the current servers for more information.